Processing Calibration, stacking, background noise reduction and initial star size reduction done with Images Plus . 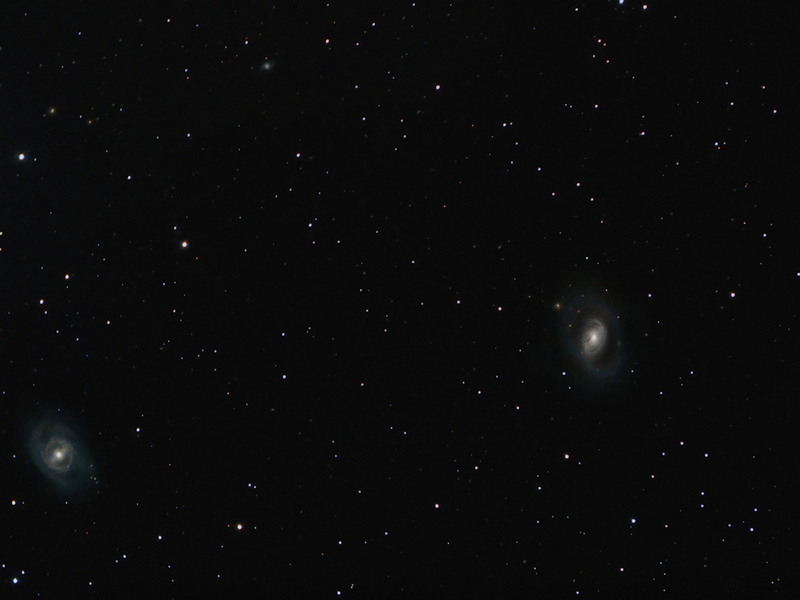 Digita; development processing was used to produce two images with different stretches, one showing the core detail and the other stretched to show the outer arms of the galaxy. A layered masked stretch technique was then used in Paint Shop Pro to combine both images. Background correction and further noise reduction applied in Paint Shop Pro . The star colour was enhanced and slight tracking error was removed . The background suffered from low to medium frequency noise in the form of blobs of colour which was corrected using Paint Shop Pro. Finally the images was rescaled for this web page and a minor sharpening run applied.